An electronic countermeasures suite is vital to the layered defenses of surface combatants. The CNO first considered developing a family of inexpensive EW suites to replace and/or complement existing and planned ship surveillance sen-sors in the early 1970s. The decision was in response to the Anti-Ship Cruise Missile (ASCM) threat that became evident following Egypt's sinking in 1967 of the Israeli destroyer ELATH using a Soviet SS-N-2 STYX. An analysis of ASCMs in development led to the conclusion that the existing AN/WLR-1 and AN/ULQ-6 systems installed on most ships could not counter ASCMs in time to prevent a hit. In addition, hard kill weapons were not effective because there was little early warning of an attack due to the characteristics of ASCMs. In 1972, the CNO authorized development of a low-cost EW suite that resulted in the AN/SLQ-32(V). The AN/SLQ-32(V) provides operational capability for early warning of threat weapon system emitters and emitters associated with targeting platforms, threat information to own ship hard-kill weapons, automatic dispensing of chaff decoys, and Electronic Attack (EA) to alter specific and generic ASCM trajectories. The Navy awarded the first production contract for AN/SLQ-32(V) to Raytheon in May 1977 and Initial Operational Capability (IOC) was achieved in FY 79. Operational Evaluation (OPEVAL) was conducted for the AN/SLQ-32(V)2 on the USS OLIVER HAZARD PERRY (FFG 7) in July 1979. In FY 82, the final Technical Evaluation (TECHEVAL) and OPEVAL were completed for the AN/SLQ-32(V)1 and (V)3 on board the USS MISSISSIPPI (CGN 40). Shortly after production began, the Secretary of Defense directed the implementation of the Electronic Warfare Improvement Program (EWIP) to ensure that system performance was upgraded to meet evolving threats. The resulting improvements were implemented starting in 1987 and the system was given the nomenclature AN/SLQ-32A(V). Various Engineering Change Proposals (ECPs) were incorporated as part of the "Alpha" variant. Examples include Band 3 Improvements (ECP 206) which increased ES range by increasing the sensitivity in Band 3 and providing high elevation angle coverage; Digital Processor Unit (DPU) Upgrade (ECP 463) which incorporated a 20 MB hard drive, and provided a new processor that was three times faster than the old system; Interference Suppression (ECP 469) which improved Continuous Wave (CW) high pulse repetition frequency processing capability, increased the number of Band 3 Electromagnetic Interference (EMI) filters, increased the flexibility of the two existing fixed frequency notch filters, and reduced the processing load of the Digital Tracking Unit; and Semi-Omni Antenna for Band 3 (ECP 470) which provided increased isolation from own ship emitters by reducing the gain in the direction of the transmitters and sea reflections, and increased antenna gain in the direction of threats and improved elevation coverage. Additional improvements were made but were not part of the "Alpha" upgrade. AN/SLQ-32(V)3 adds Electronic Attack [EA] jamming capability against the targeting and ASM terminal guidance radars. The Navy will continue to have versions of the SLQ-32 on some of its ships for at least another 10-20 years. However, the 30-year-old technology of the SLQ-32 cannot be upgraded or modified to provide the full capability needed by the fleet to deal with the modern missile threat. In May 1987, the USS STARK (FFG 31) was attacked in the Persian Gulf by two Exocet missiles fired from an Iraqi Mirage fighter. After the USS STARK incident, an urgent requirement was established to provide an electronic attack capability on FFG 7s equipped with the electronic-support-only AN/SLQ-32A(V)2 Electronic Warfare (EW) system. A Rapid Development Capability project was started and in six months SIDEKICK was fielded. A rotatable pool was established to keep the operational availability high. The AN/SLQ-32A(V)2 in combination with Sidekick is known by the nomenclature AN/SLQ-32(V)5. Performance is optimized for protection of a ship from radar-directed anti-ship missiles (ASMs) and for confusion of targeting radars on hostile platforms. The AN/SLQ-32(V)5 can detect high-altitude threats and missile threats at the radar horizon, perform deception jamming of missile seekers and noise jamming of targeting radars, and track multiple emitters. The Sidekick system consists of an additional equipment rack and support equipment, which are located in the EW equipment room, and two additional outboard enclosures containing the transmitter units. The transmitter units located on the port and starboard sides each provide 180 degrees of coverage. Unfocused noise from output traveling wave tubes is coupled into the AN/SLQ-32A(V) receivers affecting both Electronic Attack and Electronic Support functions. Topside design in certain ship classes impacts the severity of the problem. For example, SHIPALT CG 47-00268 relocated decoy launchers to avoid a RADHAZ zone but simultaneously aggravated the EMI issues. Test installation of RF Absorbent Materials (RAM) barriers between frame 174 and the AN/SLQ-32A(V)3 in USS COWPENS (CG 63) in April of 1996 resulted in Instantaneous Frequency Measurement (IFM) noise levels returning to normal. RAM barriers, like those installed in USS COWPENS, will be required on 23 non-Passive Countermeasure System (PCMS) treated CG 47 Class ships. The Radio Frequency Isolation Self Test (RFIST) for the AN/SLQ-32(V) is approved for use and the support structure has been established. When the AN/SLQ-32(V) is performing electronic attack (EA), some of the radiated energy is reflected from the superstructure and detected by the Electronic Support (ES) receivers. The AN/SLQ-32(V) employs a process called Dynamic Threshold Leveling (DTL) that prevents radiated energy from being perceived as a new emitter, causing operator confusion and resource drain. DTL uses constants embedded in the operational software to desensitize the receiver thresholds based on the transmission's angle and frequency to essentially eliminate false emitters caused by these reflections. RFIST was developed to replaced earlier isolation methods and systems that were manpower and equipment intensive, time-consuming, and external to the SLQ-32. RFIST utilizes the SLQ-32 receiver and transmitter systems under software control internal to the SLQ-32 itself, loaded by a separate magnetic tape cartridge (MTC) or from the hard disk in the same manner as existing SLQ-32 operational and diagnostic software. In the past, specially trained personnel using special test equipment determined these constants. Because this process was expensive and logistically difficult to accomplish, measurements were infrequently taken or not taken at all. RFIST allows each ship's company to perform its own measurements at a convenient time and periodicity. Because even minor changes to the area around the AN/SLQ-32(V) antenna enclosure or superstructure can change the reflecting characteristics countered by the DTL process, the RFIST process should be performed whenever changes in ship configuration occur. The more data that is available for a ship, the easier it is to recognize bad data when it occurs. Additional data also increases the confidence in the values embedded in the software. It is therefore beneficial to run RFIST as frequently as is practical. Although essential for the correct operation of the DTL process in the operational software, it is not necessary for the DTL gate width timing alignment to be properly set in order to run the RFIST program and get good results. It is essential for the AN/SLQ-32(V) to be free of faults that might affect correct operation of the system's radio frequency part. RFIST Revision 1.0 was the initial research and analysis release for proof of concept. It has since been revised several times to allow autodetermination of variant and data collection on all active variants of the SLQ-32. The most recent revision (7.0) allows use of the hard disk to allow interrupted sessions to be continued from the point of interruption. RFIST Revision 7 operates in all current active versions of the AN/SLQ-32(V). This includes the AN/ SLQ-32(V)3, A(V)3, (V)4 and (V)5. The RFIST software automatically determines which variant it is installed in and operates appropriately. The operator interface is identical in all cases. Revision 7 allows use of the hard disk to temporarily store data. Blanking has reduced or eliminated most interference from own ship's pulsed emitters in the AN/SLQ-32(V) Countermeasures Set. Blanking disables the RF front end on a receiver that is effected by an own-ship's pulsed emitter for a set period of time when the emitter generates an RF output pulse. To minimize degradation (receiver off-time), blanking should only occur when it is actually needed. The AN/SLA-10B Blanker Unit associated with the AN/SLQ-32 used one blanking pulse width and delay to process each pretrigger input. To ensure the interference is reduced to a minimum, the blanking pulse's duration is set to blank the emitter's longest pulse duration and the worst case situation of sea return. For all but worst-case situations, this adjustment will result in overblanking of the AN/SLQ-32. Optimum blanking alignment is achieved when PULSE DELAY and PULSE WIDTH controls are set to the minimum values needed to provide consistent blanking, while limiting the impact on receiver "OFF" time. Insufficient blanking will cause Own Ship emitters to be processed and dis-played, while excessive blanking reduces receiver "look time." Blanking procedures should be performed in a normal sea state environment to minimize the effects of weather conditions on the receiving capability of the AN/SLQ-32(V). When high seas exist and sea return presents a problem, blanking pulses may be increased to compensate for reflection of ownship emitters. However, blanking pulses should be returned to normal sea state alignment settings once the weather conditions return to normal. In the past, the AN/SLQ-32 has been able to tolerate the overblanking caused by the limitations of the AN/SLA-10B with little degradation in overall system performance. However, with many of the emitters currently being introduced into the fleet, the use of large variations in pulse width and pulse repetition interval to achieve improved performance resulted in significant AN/SLA-10B overblanking (receiver off-time). One approach to resolving the problems is to develop Automated Blanking. With a blanking card that can be made smart by using a feedback loop from the AN/SLQ-32. This improved blanking card continuously readjusts the blanking pulse width based on the various activity strobe data available from the AN/SLQ-32 presorter. Due to the nature of this concept, it is only applicable to AN/SLQ-32 Bands 2 and 3. A prototype Automated Blanker has been designed and tested at NSWC Crane. The prototype consists of a temporary breakout box that extracts the feedback signals from the AN/SLQ-32 and the pretrigger signal from the AN/SLA-10B. Lab testing of the prototype is complete. An at sea test was conducted aboard the USS Klakring (FFG 42) from 28 April through 2 May 1997. If funded, this modification would be implemented as a field change (FC). Due to the extent of the FC, the conversion would be accomplished via restoration of AN/SLA-10B at NAVSURFWARCENDIV Crane. A rotatable pool would be established using decom assets. During the restoration, the required modifications would be added. The modified system would then be installed aboard ship. The upgraded DDI Console is a Standard AN/SLQ-32(V) Console with a bullnose modification allowing for control of up to six decoy launchers, FAB functionality modifications, and additional circuit cards that provide fully automated decoy launch capabilities. All AN/SLQ-32(V) units were originally slated to receive DDI Consoles; however, development of the Nulka decoy and reduced funding have limited the number of DDI Consoles being procured to approximately 40 units.When the Mk 36 Decoy Launching System is modified to add Nulka capability (changing the designation to Mk 53), all the launchers are connected to the new Decoy Launch Processor, which duplicates many of the hardware improvements found in the DDI Console. For this reason, ships with Nulka installations planned will retain the Standard Console, while the DDI Consoles under procurement will be directed toward non- Nulka ships. * The system selects the launchers, tubes, and reseed intervals for each engagement. The operator presses the ARM and QUICK LAUNCH FABs, when prompted, to actually launch the decoys. In February 1998, Naval Surface Warfare Center Dahlgren began delivery of Revision 17 operational software to AN/SLQ-32A(V)-equipped ships. Following the successful completion of Follow On Test And Evaluation (FOT&E) in April 1997 at Wallops Island, MD the Program Executive Office (PEO) Theater Air Defense (TAD) began fleet deployment of R17.00 operational software for the AN/SLQ-32A(V)3 Electronic Warfare (EW) suite. The R17.00 operational software merges capabilities certified during previous successful Operational Tests (OT) for Phase B, Rapid Anti-Ship Missile Integrated Defense System (RAIDS), and Deceptive ECM/Decoy Integration (DDI). The biggest change in R17.00 is the integration with DDI. Testing with DDI had proven to be over 95% effective in countering incoming threats. R17.00 also incorporates Software Change Proposal (SCP) changes and corrections for Feedback Reports/Trouble Reports (FBR/TR) against R16 and previous loads. In order to reduce extra / false tracks R17.00 implements the correlation of new emitters with existing emitters that have a high angle change rate by use of emitter angle history to predict emitter position, it correlates different pulse repetition interval (PRI) results to the same emitter. In addition the upgrade correlated emitters to on-board radars, which allows operator to enter on-board radar parameters into a table and prevent display of emitters caused by on-board systems. The upgrade also correlate signals reported at different AOAs to the same emitter. R17.00 has the added capability to correlate Band 2 emitters in addition to the current capability for Band 3 emitters. The capabilities includes correlation of Band 2 / Band 2, Band 2 / Band 3, and Band 3 / Band 3 emitter combinations. With the integration of DDI, the system can now make anticipated platform modifications. For single emitter identification, R17.00 prevents correlation of emitter candidates that don't have anticipated platforms with existing platforms that do. It also prevents the operator from eliminating emitter candidates with anticipated platforms. Another capability is the implementation of Selected Emitter Automatic Response (SEAR) to initiate EM jamming against non-missile threats with minimum operator actions. This will compare new emitter detections against operator defined automatic engagement criteria (ELNOT, bearing sector), and engage new emitters automatically without operator intervention for positive comparisons. 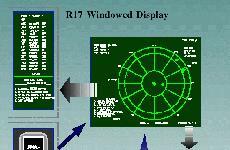 Display modifications were added to improve human machine interface. The improvements were made possible by replacing most tabular displays with windowed displays that can be inspected and changed without leaving the polar display. The displays allow the operator to sequence to and review alerts without losing information entered during a prompting sequence. R17.00 implements scan algorithm improvements that increase the number of emitters for which scan can be successfully determined and allow scan to be determined even under conditions of dropped lobes or staggered/pulse group emitter types. A modification has been added in order to automatically suspend engagement of and release resources assigned to a non-missile emitter whenever the emitter becomes inactive (i.e. Digital Tracking Unit (DTU) sends delete emitter message to Digital Processor Unit (DPU)). Then the software will resume engagement automatically whenever the emitter becomes re-activated. R17.00 has been modified for anticipated platforms; to display only platforms that could be active in the current Geo-area. List emitter modes by frequency without arbitrary band partitions. Increase size of Threat Data Base to 2048 modes; 1024 emitters; 1024 platform names; and 2048 mode-to-platform links. Increase On-line Library size to contain 320 modes. Eliminate multiple Geo-specific libraries. Implement a single, world-wide threat database in which modes are Geo-tagged with the specific region or regions in which the mode operates. Allow operator to select the appropriate Geo-area. Allow operator to query the Threat Database using an operator-entered set of parameters. Provide for Threat Database review sorted by frequency, PRI, scan period, index, name, or ELNOT. Allow Threat Database review for one Geo-area or all Geo-areas. R17.00 also implements improved Tunable (YIG) Filter Control and Coordination, the monitoring of H and W duty cycles requested for EM jamming technique use and will deny requests that would exceed 100 per cent duty and automatically enable alternate techniques. R17 software dramatically changes AN/SLQ-32A(V) operation in the human interface, system operation, and threat engagement areas. Among these changes are Deceptive EA and Decoy Integration (DDI) algorithms that allow for system control of decoy launches and coordinated engagements. R17 is not compatible with previous software loads (R16, etc.) because data is not necessarily written to identical locations on the hard disk as previous software versions. Additionally, libraries saved to the hard disk are not interchangeable between software versions. Prior to loading R17 software onto the AN/SLQ-32(V) hard disk, it is imperative that any previously loaded operational software versions be removed. A number of ships have reported problems in connection with loading or running Revision 17 (R17) operational software and the Revision 10 SDT using the hard disk. These problems include system crashes when operating from the hard disk, the inability to fully write the software to the hard disk, and the inability to load from the hard disk. In each case, it was discovered that the ship had not removed a previously loaded version of operational software from the hard disk. The decommissioning of ships with installed AN/SLQ-32(V)s provide assets to be used on new ships. Rather than award additional contracts for new production systems, the US Navy decided to restore systems from decommissioned platforms. The Navy terminated production of new systems after Lot 15 and implemented a joint effort between NSWCCD and Raytheon for the restoration of systems. A total of 450 systems, US and FMS, were procured through Lot 15. In November 1995, the Navy awarded Raytheon a contract for restoration of three AN/SLQ-32A(V)3s. NSWCCD restored and upgraded parts of the system and prepared enclosures for installation of articulated doors. The hardware was then shipped to Raytheon for assembly and sell-off. The Navy awarded another restoration contract for eight AN/SLQ-32A( V)2s and one A(V)3 in the second quarter of FY 98. CNO Memo of 14 May 1996 Ser 00/6C5000044 terminated the AN/SLQ-32(V) Program and directed reprogramming of funding to the Advanced Integrated EW System (AIEWS) Program. Because of its advancing age and the incremental introduction of AIEWS, the AN/SLQ-32(V) Fleet assets will require support well into the twenty-first century. As the replacement for AN/SLQ-32(V), AIEWS will use an open systems architecture to lower investment costs and improve system effectiveness. Due to the open design, this system will allow for ease of future technology insertion, dramatically improve human computer interface to promote smartship manning, and promote full integration with the shipboard LAN and combat systems. 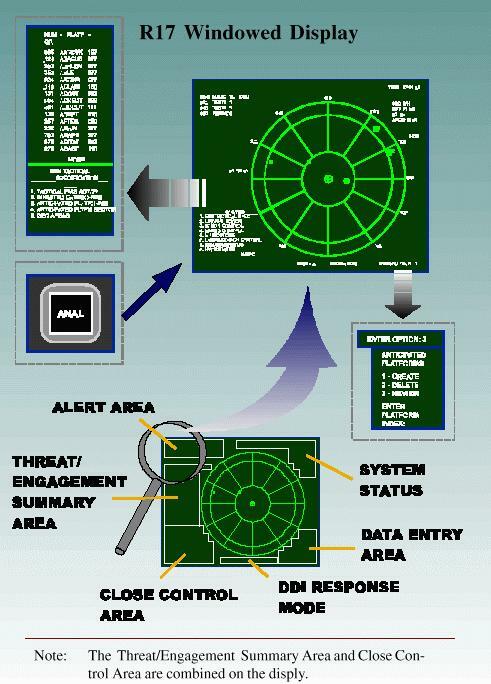 The Navy will introduce AIEWS in two increments: the first designed to provide improved human-computer interface, improved emitter processing, a new receiver package including a special signal receiver, specific emitter identification capability, and enhanced combat system integration; and, the second increment is to include an advanced electronic attack subsystem. All AN/SLQ-32(V) procurements through DDG 79 were completed under Lot 16. DDGs 80-83 will utilize new AN/SLQ-32A(V)3s from Lot 15 or restored systems from Lot 16. DDGs 84-90 and LPD 17 are currently scheduled to receive restored AN/SLQ-32A( V)2 systems. When funds become available, LPD 18-21 will receive re-stored AN/SLQ-32A(V)2s if it is still a viable option. DDGs 91 and beyond as well as LPD 22 and beyond are currently planned to receive forward fit AIEWS. Included with the AN/SLQ-32A is the Electronic Warfare On-Board Trainer (EW OBT) S10H7, a Personal Computer (PC) based training system, which synthesizes and injects simulated, programmable emitter contact signals into AN/SLQ-32A EW equipment in support of dockside or at-sea training exercises. Digital and video/audio training signals representing the ship's electromagnetic environment are injected into EW system components, and are conditioned to simulate the signal characteristics of a large cross section of platform emitters. The EW OBT is capable of running either preprogrammed or dynamically built scenarios via PC interface; and it is capable of simulating over 150 emitters simultaneously. EW OBT scenarios can be either locally controlled to provide operator level training, or externally driven to support integrated Combat System team level training. The EW OBT utilizes the embedded training device to interface with EW components and provide emitter simulation, which is compatible with the on-line threat library, operator control requests, signal analysis capability, and close control. Simulated emitter characteristics specified by the scenario are selected and controlled by the embedded training device relational database management system software.